The CS320 is a digital thermopile pyranometer that measures broad-spectrum short-wave radiation and communicates over the simple SDI-12 protocol to the data logger. This sensor design eliminates measurement error and programming errors that can adversely affect data quality. This pyranometer has been designed to improve the global solar radiation measurement significantly (even under cloudy conditions) without adding substantial cost. The CS320 is suitable for applications ranging from environmental research to agriculture to large mesoscale weather networks (mesonets). The CS320 is manufactured using a high-grade anodized aluminum body and IP68-rated 316 stainless-steel M8 connector (marine grade). The CS320 sensor is heated (on/off switchable under user control) and allows continuous operation in changing environmental conditions. The pyranometer's calibration data is stored on the sensor. The CS320 combines a blackbody thermopile detector with an acrylic diffuser. This design is a significant improvement when compared with the spectral response of silicon photocell pyranometers, while offering a comparable price. Thermopile pyranometers use a series of thermoelectric junctions (multiple junctions of two dissimilar metals following the thermocouple principle) to provide a signal of several µV/W/m2 proportional to the temperature difference between a black absorbing surface and a reference. The thermopile pyranometer’s black surface uniformly absorbs solar radiation across the solar spectrum. The 0.2 W heater keeps water (liquid and frozen) off the sensor to minimize errors caused by dew, frost, rain, and snow blocking the radiation path. Dew and rain runoff is faciliated by the dome-shaped sensor head (diffuser and body). This keeps the sensor clean and minimizes errors caused by dust blocking the radiation path. The sensor is housed in a rugged anodize aluminum body, and the electronics are fully potted. 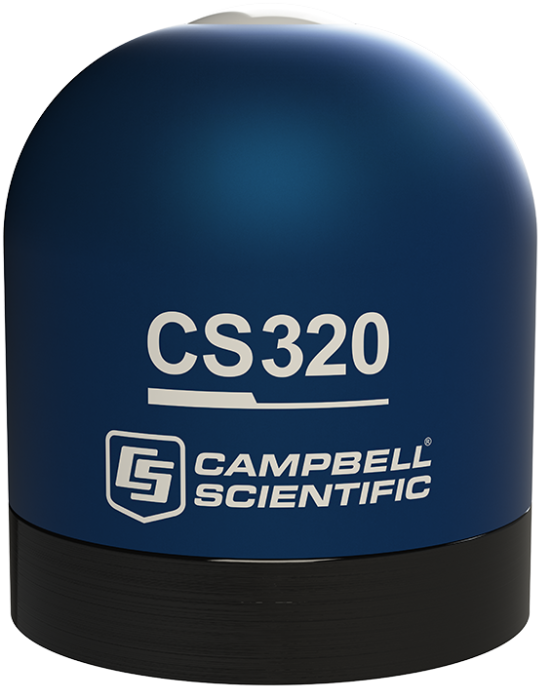 The CS320 pyranometer has sensor-specific calibration coefficients determined during the custom calibration process. Coefficients are programmed into the microcontrollers at the factory. The CS320 has an SDI-12 output (SDI-12 version 1.4), where short-wave radiation (W/m2) is returned in digital format. Measurement of the CS320 pyranometer requires a measurement device with SDI-12 functionality that includes the M or C command. Factory Calibrations Traceable to secondary standard blackbody thermopile pyranometers traceable to the world radiation reference in Davos, Switzerland. May vary due to potting. Measurement of the CS320 pyranometer requires a measurement device with SDI-12 functionality that includes the M or C command, as an analog version of the CS320 is not offered. Accurate measurements require the sensor to be leveled using a 18356 leveling fixture. This leveling fixture incorporates a bubble level and three leveling screws. The 18356 mounts to a crossarm using the CM225 mounting stand. The CS320 should be mounted away from all obstructions and reflective surfaces that might adversely effect the measurement. Is it possible to read the output from a CS320 in a 4 to 20 mA form? Can a CS320 be calibrated to a smaller range to measure only PAR (photosynthetically active radiation)?